For the second time this year (so far), I'm on my way to Iceland! I'm writing this from a departure gate at Seattle-Tacoma International Airport. Needless to say, the Icelandair flight departs from the most remote corner of the airport, from a gate so obscure that there are no signs pointing to it. However, I am an EVE player and am therefore used to adversity. My real-life move went well and even now about half of my belongings are still in boxes back home. I managed to get my gaming rig running for a few minutes to make sure it survived the trip. Priorities. You understand. From there, it was a matter of getting packed for the trip. Iceland seems to have given spring and summer a miss and went stright on into autumn. 50F/10C, and rain. That altered my packing a fair bit so fortunately I knew where amongst the boxes to find such California summer requirements as a water-proof jacket. Ali Aras gets CSM member MVP this week for posting all of the summit topics on the EVE-O forum. If you feel strongly about a particular topic, please comment on it! I'll be doing my best to make sure I have each thread fully read before we go into that particular session. She also has the summary of the schedule posted on her blog if you want to review it there and understand each day's topics. One of the side effects of putting the summit after CCP's traditional July/August vacation period is that there wasn't as much warning either for the CSM or for players to talk about the topics prior to the summit. On the positive end though, most of the topics are pretty universal (you'll forgive the pun, I hope). What with the move, I'm getting a little behind in my EVE mail so if you've sent me something within the last week or so and I haven't responded yet, I apologize. I will definitely get back to you as soon as I can. I do want to take this opportunity to say "thank you!" again to all of the people who voted for me, particularly the faith you showed in me by making me one of the top two vote recipients. I guess I should feel a little nervous about this summit but at the moment I really don't because I know I have so many of you behind me on this. So again, thank you so much! In terms of the mechanics of getting the seven of us who are going to Iceland, CCP Dolan works with a CCP company travel manager to arrange flights, hotel bookings, and so forth. We just specify departure airports. So that part is really convenient. Today is a travel day with an overnight flight in to Reyk. I arrive at 6:45am Tuesday morning. The summit itself starts on Wednesday. Last year, I took a week off for vacation in October. This year, my vacation time from work is going to be turned over to Fanfest, two Iceland summits, and my long-implied real-life move which starts... tomorrow. I then segue straight from that almost directly onto an aircraft for the Summer Summit. There will be one more regularly-scheduled blog post -- probably tomorrow -- called "What's in a name?" Then I hope to publish something daily from Iceland the same way I did during Fanfest. But other than that, regular features and commentary and such are likely to be a little light around here unless something really earth-shattering happens in the meanwhile. So I'm sorry, but you're going to have to be a productive member of society for a bit. Bravo, Morpheus Kion. +1 internet to you, sir. And this Nightmare was also kind of an entertaining gank. It's an incursion sniper, obviously, and killed by an embarrassingly small number of Tornados for an equally embarrassing profit. I'm amazed that gankers don't follow incursion ships around and pop them on site entry gates routinely. Every incursion fleet I've ever been in has a ship like this and ship scanners aren't that hard to use. I'm entertained by this one because it was incomplete: he apparently hadn't found the last two officer guns he wanted yet and now he has to start all over. Amusingly, there are two on the market as of a few hours after this ship died. 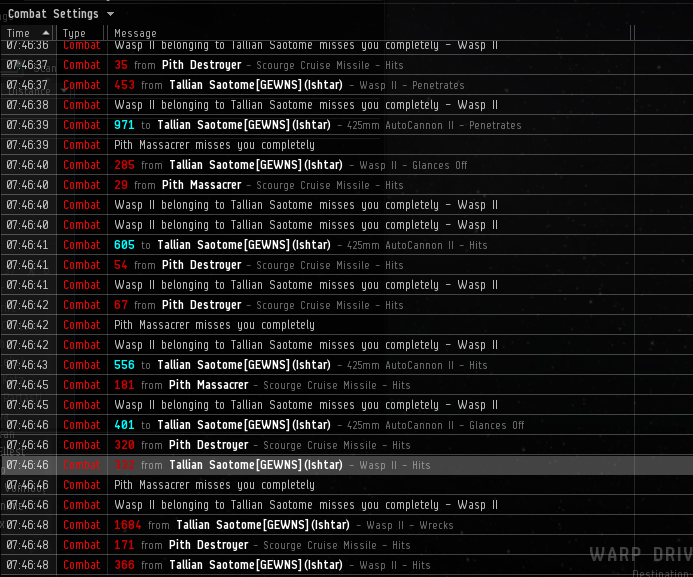 That was it on supers, though this super-expensive Rorqual also died in low-sec. The system of Oddeluf has two stations, one a safe undock, the other... not. Given the small fleet that took this Rorq out and given that the KB comments said there were friendly carriers docked that could have provided support, I'm going to go ahead and assume that this Rorq undocked from the "not safe undock" one. It also seems to have been carrying a reasonable percentage of someone's life savings in EVE. So it's almost a super. That was it for this past week, though, and this coming week is only looking slightly better. Only one super death so far. Sometimes you have to throw together a little mock-up to explain an idea visually. This is a mock-up, not a feature. But I wish it were a feature. 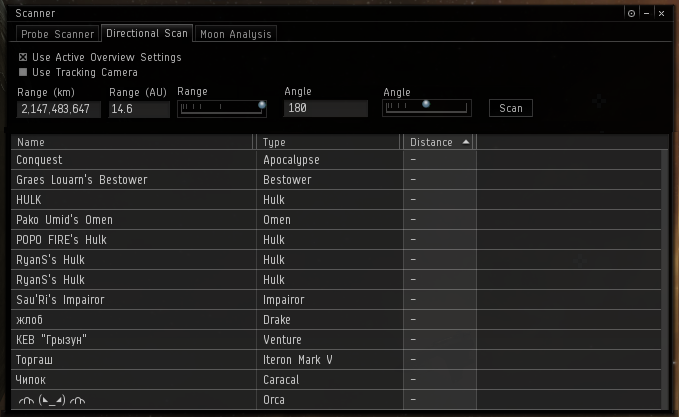 "Hey CCP, how about a range slider on the d-scanner that would let you quickly and easily set d-scan range to various increments? The slider would update the number in the text field, and vice versa." So there you go. It's set and will be announced soon(tm). We continue to be in the roll-up toward the Summer Summit, which is now coming up in less than ten days. Surprisingly though, we don't have the topic list yet for it. I was pretty much counting on us having this by yesterday but it didn't happen. I suspect this is a side effect of the much later Summer Summit than is typical, combined with it taking place immediately after CCP's vacation season. That's cutting into the time needed to organize the Summit, decide on the topics, and get them announced to all of you. Needless to say as soon as we have that information, we'll get it out to you. In the meantime, this is a good lesson to take out of this later Summit for next year for CSM9. Trebor Daehdoow took some time out to talk to Penny Arcade Report and that article came out this week. It's really more of an EVE intro piece than anything else, but is a lovely example of the CSM "activism" that I called for last year... and I didn't even do it. 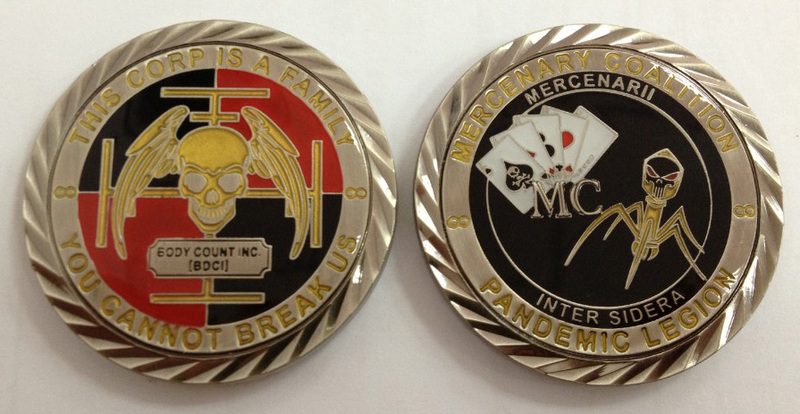 ;-) But sometimes the best thing the CSM can do is sell the game! And now that the Providence civil war is over, Ali Aras is going to be restarting her Space Hangouts on Saturdays at 2000. I'm pretty sure this is the link you want to participate. 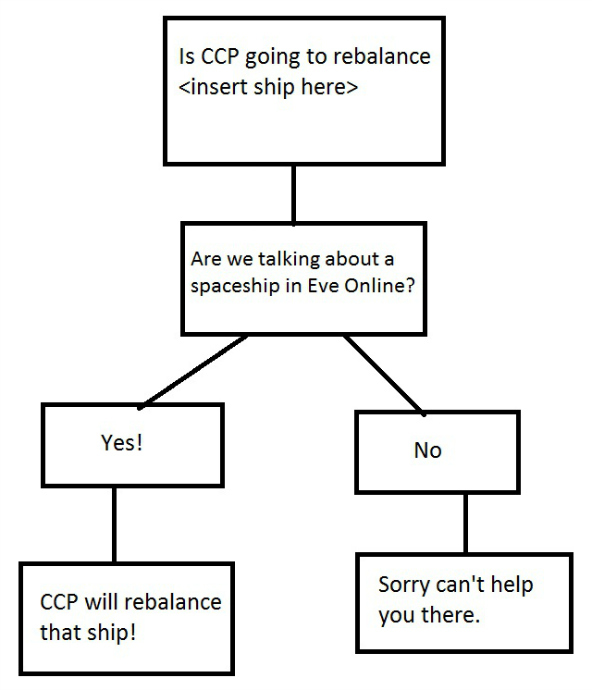 The CCP/CSM Skype channel is heating back up, but it's mostly casual chatter right now. The devs are busy with Odyssey 1.1 preparations and debugging of stuff discovered on Singularity. There hasn't been a new topic on the Internal CCP/CSM forum in a couple of weeks; in terms of Winter expansion stuff, we're mostly thinking through a brainstorming project that CCP Fozzie gave us while waiting for the Summit. That started with our second CSM8 Town Hall over the weekend, which was attended by Ali Aras, Chitsa Jason, James Arget, Korvin, Malcanis, Mangala Solaris, Mike Azariah, Sala Cameron, Sort Dragon, Trebor Daehdoow, and myself, Ripard Teg. So quite a good turn-out! The recording is already up, so go give it a listen; it's just over one hour in length. We were asked lots of really good questions, and we got to almost all of them. We did miss a few (including a couple that were sent to me in EVE mail) so I'll be getting CSM8 members to answer them this week and posting the answers into the EVE-O forum thread. EVE Radio as usual did a stellar job with the broadcast, both through their own medium and on twitch, and EVE University again donated their public Mumble server for our use. Thank you again so much to both of these organizations (and most particularly DJ Wiggles and Neville Smit) for helping us, and thank you to everyone who attended! Town Hall #3 is tentatively scheduled for early October, or as I put it to Neville Smit, "the weekend after we get the Summer Summit minutes out." That's going to be fairly heavily dependent on how fast CCP can and will approve them, but I've set a tentative schedule for it for four weeks after the end of the summit, which would put the minutes out around October 1. Hopefully, that's not overly optimistic. First, if you haven't already done so, go out and read this masterful article by Lockefox on TMC. It is -- by far -- the best thing written on TMC so far this year, an incisive, well-researched article into the history of moon-goo in general and its impact on the CFC in particular. Go read it, in full. I'll wait. That single little graph, more than any other factor, is probably what sealed the fate of TEST in Fountain. It documents the collapse of a financial empire that makes the Great Depression's tumble pale by comparison. Presented in that context, the doom of anyone near CFC territory holding the new R64s is obvious. If tech was a drug, that graph charts the withdrawal symptoms and they ain't pretty. The corresponding graph detailing the prices of the new R64s post-Odyssey finished the job. 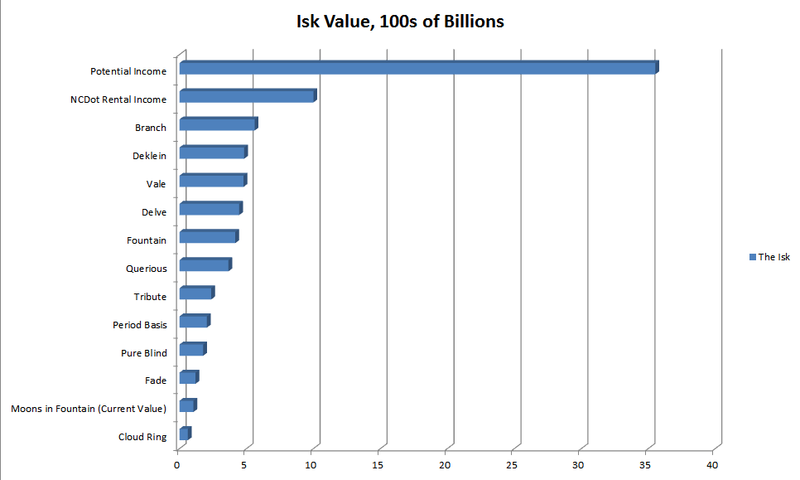 That thick green line, showing the average price of R64s at a bit over 20k ISK per unit tells the tale. As I write this, technetium is below 14k per unit. At 80k per unit for tech, the future of the CFC's empire was secure. At 25k or less? Not so much. Short version: even if the CFC held every moon in EVE, they probably couldn't finance the lavish ship replacement program that their empire was built on. I could have easily called the blog post "Be careful what you wish for". Or just maybe "The heavens blaze forth the death of Princes". I'll let Mord Fiddle have that second title, because I can't imagine it's too long before he starts gloating. I just checked. He hasn't posted his CFC post-moon analysis. It's definitely coming. I can feel it. So let me say it again and let's talk about this bit in particular: even if the CFC held every moon in EVE, they couldn't finance the lavish ship replacement program that their empire has been built on. CCP has... very quietly... very sneakily... given people what they've been asking for for going on four years now. We live in a post-moon New Eden. Sure, moons are still going to be valuable. At today's prices depending on the size of the tower, dysprosium and neodymium are going to be worth about 1.5 billion a month, promethium about 1.3 or so. It's not money to turn your nose up at. But it's also not the seven or eight or more billion per month that tech once poured into an alliance's coffers every moon. After those three moon-goos, the values drop precipitously. Tech is barely worth a half billion per moon per month. A few moons have to be mined at a loss. We live in a post-moon New Eden. And it happened very quietly while most of EVE wasn't looking. Now we have to stop and seriously consider: are things about to get better or worse? Pubbie scrublord money is where the next fix is coming from. Goons are about to become that very thing they have despised forever: slumlord renters with a contact list even more full of blues, their space full of blue Tengus and Ishtars and Retrievers and Taloses and even PvE battleships that they aren't allowed to shoot... that they aren't even allowed to think about shooting... that they aren't even allowed to scam into thinking that they might shoot. Oh dear Heaven, how the mighty have fallen. And what makes it doubly glorious is that the long asked-for treaties and rent control measures that EVE's existing slumlords have been asking for for about a thousand years aren't in the game. The fixes and changes and mechanics that could have made this at least semi-palatable to the average Goon -- that CFC leadership could have started stomping their feet to obtain two years ago -- are not in place and aren't going to be in place. Meaning that CFC leadership had to announce a little bit shame-facedly that Goons aren't allowed to scam would-be renters any more because of the danger of scaring off the real renters that they are so desperately going to need... nowish. Wherever SirMolle is, he's cracking a beer and having a good long laugh. Anyway, the full court press to convince Goons that this is a good thing -- really! -- has begun in earnest, spear-headed by that very same TMC. All the while, CFC members are also doing their very best to convince themselves that they are definitely not Band of Brothers... mostly I think because they're saying they aren't expecting their renters to die gloriously for them as cannon fodder or even to form up to defend their homes because Goons -- Goons! -- Goons! -- will be doing it for them! And holy crap I can't believe I just typed that. When The Mittani was bounced off CSM7 last year, one of the things he said in his first GSF address to the troops afterward was that he wasn't even all that upset about it. The reason was because being a good CSM member -- whose job it was to stand up for EVE players -- and being a good Goon -- whose job it is to troll and torment EVE players -- were fundamentally incompatible goals. Needless to say, it's going to be quite interesting watching GSF having to adjust to having some pubbies that they have to treat well and protect while having other pubbies that they can still gank in high-sec somewhere. But finally, let's come briefly back to the question I asked earlier: is this better or worse for New Eden? And that I think deserves a post to itself. Look for that tomorrow. First things first: because this is a tight fit, this is an old character's play-thing. Brave Newbies like Talwars but they mostly like them because lots of cheap meta1 mods can be fitted to them with even cheaper rigs. You throw in a small pile of Nova Missiles (faction or otherwise) and when a bunch of them get firing, suddenly you have some 1200 volley damage Per Talwar. Short version, 50 or 60 of these means that you have sufficient volley on field to alpha through even relatively tough targets like HACs and battle cruisers. The DPS is even pretty reasonable, at 120 to 150 depending strongly on player skill and the exact meta of light missile launchers chosen. Don't choose particularly expensive launchers It's unlikely you'll live to bring them home. The only difference between this ship and the Brave Newbies version is that this one tanks better... whereas a Brave Newbies Talwar dies to a single bombing run. They don't care; they're not proud. After the missile launchers, damage assist mod and MWD, the next most important module is at least one rig improving missile flight time or speed, maybe even two of them. This is not a brawling ship. It has the sig radius of a small cruiser and the EHP of a frigate. It's not a good combination and it should try to stay out of range of damage, particularly HAC damage which can absolutely eat this kind of ship. The missile flight time rig combined with a Sensor Booster allows the ship to shoot missiles almost to the extent of its 72km lock range. Not many HACs can effectively counter-punch at that range. After that, I've filled in with a MWD and the remainder of a tank, most particularly Medium Shield Extender and a T2 MAPC so that I can fit both it and the MWD. As implied above, this is the ultimate skirmishing ship; it should be fighting in the 45-50km range. There's no point fitted because the last thing this ship should be doing is tackling things. Therefore, a Talwar fitted this way is highly reliant on either close-range tackle, bubbles in null-sec, or -- daringly -- no tackle at all. With each Talwar doing 1200 alpha and enough of these little monsters on the field, your enemy might not realize that he's going to start losing ships until it's too late. This will take a small bit of timing on the part of your FC since like all volley damage, it's better if the volleys arrive together to minimize the likelihood of enemy logi undoing your good work. That, incidentally, makes this Talwar remarkably easy for beginners to fly: skirmish away from your targets, lock the ones your FC tells you to, fire when you're told to do so. It couldn't be much more straight-forward. Finally, there isn't much point to carrying other types of missiles. The Talwar gets a significant explosive damage bonus. Still, if you want to carry one reload of faction Mjolnirs, I won't stop you. Shield ships are traditionally pretty well-tanked against explosive damage and you might want to try the alternative. Yeah, that's a Rote Kapelle ratter-hunter Cynabal being murdered by one of the ratters he was hunting. And the ratter in question was AFK. Whoops! Story here is pretty straight-forward, though. The pilot involved is an extremely experienced ratter-hunter but also has been away from the game for a while. As a result, he was not yet fully versed on some of the more interesting changes in the game lately, like Drone Damage Amplifiers, the reduced tank needs this puts on Ishtar ratting ships, and the fact that rats now aggress on threatening targets rather than staying locked on a tank. This means that ratting ships can be thinner and can incorporate changes like Drone Navigation Computers which make Wasp heavy drones quite quick. Now combine this with an overly aggressive, overly confident ratter-hunter who burns in super-close to his relatively motionless target to apply Hail DPS... rather than the EMP damage that would be more appropriate against a shield-tanking ship. He also applied e-war drones to his prey, mistakenly thinking that the targets drones wouldn't go after him... then badly underestimated the amount of damage those drones would do to his... ummm... relatively motionless ship. I think you'll agree that mistakes were made. ;-) You can see the Cynabal's DPS drop off markedly as he realizes he's in trouble toward the bottom of the log and starts burning away from the Ishtar's drones. Too little, too late. Needless to say, we in Rote are trolling the victim here mercilessly, particularly after he initially bitched that he was going to petition the loss... That said, the Ishtar did die, presumably finished off by rats. The next one is kind of fun, this Nyx. Story on this one is that the ship got bumped out of a POS force field somehow while the pilot wasn't present, perhaps by bumping off a POS mod with the residual speed that a ship has when you eject from it. The two killers from Black Legion and Origin, apparently had the choice of either stealing the now unpiloted Nyx or killing it. They chose the latter. When you eject from a ship, your character name remains associated with the ship for a period of time and if killed during this period of time, the game assigns a kill-mail. So that's an entertaining little kill for the two guys involved. Last is this Fidelas Constans Nyx, killed in low-sec by Shadow Cartel and friends. This one was fairly pimped out even by super-capital standards, featuring a super long-range officer smart bombs and two VERY expensive officer cap rechargers as well as a few other officer mods. EN24 has the story on this one, which essentially starts with a Caldari militia tackle on the super followed by the obligatory bat-phone for the DPS needed to kill it. Other than that and a video, the story is pretty thin. I've commented before on TMC letting the opinions of their reporters into their news articles and not exercising sufficient editorial oversight over the practice. The combination creates the situation we have today where many EVE players -- even large numbers of loyal TMC readers -- regard themittani.com as nothing more than the CFC propaganda arm rather than a news website. Attempts to contact TEST leadership were unanswered, and TMC was politely told to leave. Insidious Empire is leaving the south entirely over the next month. With NCdot quietly taking over Querious the last couple of months, no points for guessing what happens next.